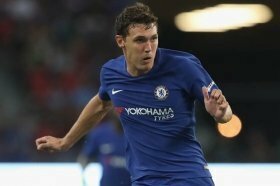 Denmark international Andreas Christensen has said that he wants to become the best defender in the world at Chelsea and has no plans of leaving the club in the summer. The Dane was recently said to be frustrated with the inability to secure regular gametime with the Blues, but he has gone on to dismiss the claims by expressing his commitment towards the club. In a report covered by Goal.com, the centre-back said that he has no desire to leave the Blues in the near future, and it remains a dream to become one of the best with the west London side. “I wouldn't play football if I didn't have a dream or a target. [Being the best in the world while at Chelsea] is still the dream.” he said shortly after the 1-0 triumph over Slavia Praha in the first leg of the Europa League quarter-final. Chelsea are in Premier League action for the weekend where they face Liverpool on the road. The Blues have remained unbeaten in the past five meetings against the Reds but face a tough challenge nonetheless.